This post marks my 100th Blog entry. I know it's been over a year since I started this blog, and that it's changed drastically since then. What started out as a family blog turned into a way to share my creations and thoughts with my friends. It seems fitting somehow that as I change and grow my blog does too. This week I'm so lucky to be able to celebrate the remarkable independence of two countries: my native land, Canada, and my home, the U.S.A. I'm proud to be part of both places. I'm grateful to live in a free land, to be able to believe and live as I do, and that is truly what I wish to celebrate. So on this lovely 4th of July I want to show my appreciation to my friends, family, and readers with a give away that shares a small part of my beliefs! This is for all those of you who have a beautiful Young Woman in your home, whether part of the LDS Young Women's program or not, or if you know of a Young Woman who could benefit from this special gift. Please enter. 1. Post a comment below sharing your favorite value and why. I have comment moderation on so your post will not show up until after I approve it. 3. Give Away ends Friday, July 10th at midnight PST. The winner will be chosen randomly and announced by Monday, July 13th. If I know you I will directly contact you when I post the winner, if not, I will need you to email me using the link in my profile. *For those of you interested in making this project I will post instructions later this week. I think my favorite value is Divine Nature. 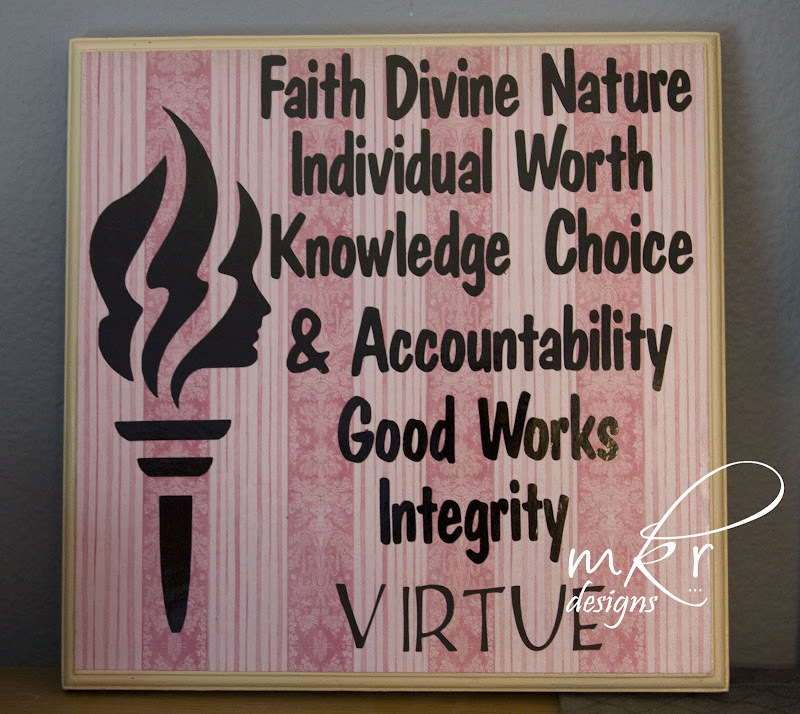 Knowing that I have a divine nature is linked to my faith, helps me value my individual worth, encourages me to gain knowledge, helps me appreciate my choice and accountability, motivates me to do good works, and gives me a true reason for having integrity and protecting virtue. My daughter will be a YW in 3 years and I hope she will see by that age that she is truly divine and want to have these values in her life. Hooray for a give away!! I have a hard time choosing a favorite... so I will just say I love that they included virtue into the values, especially for this generation.